Language Log: Truthiness: a flash in the pan? Truthiness: a flash in the pan? Has the golden era of truthiness already passed? 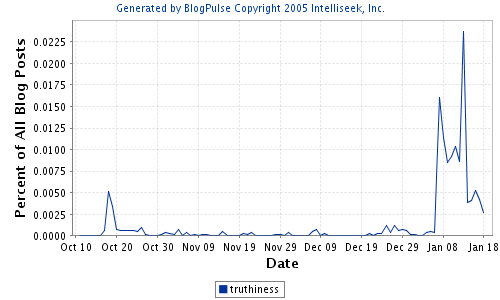 The above graph, generated by BlogPulse, suggests that inhabitants of the blogosphere are already losing interest in Stephen Colbert's term for faux truth, less than two weeks after the American Dialect Society named it Word of the Year and Colbert launched his offensive against those who would deny him credit for the coinage. The recent controversies in the literary world over the pseudo-memoirs of James Frey and J.T. Leroy may have provided one final boost, as the word was featured prominently in commentary on the scandals in USA Today, the Chicago Tribune, and the San Francisco Chronicle. But even if truthiness is already on the wane, at least it was a fun ride. Wordanistas are split on the viability of the term. Even before the ADS vote, noted etymologist Anatoly Liberman speculated on Minnesota Public Radio that truthiness might enter new dictionaries in the next year or two (presumably with a sense differing from the archaic meaning of 'truthfulness' found in the Oxford English Dictionary and the Century Dictionary). But even Liberman — clearly not a fan of "The Colbert Report" — disparaged the word as "rather ugly and rather useless." On the ADS mailing list Allan Metcalf wrote, "Like astronomers witnessing the birth of a nova, we are watching the nativity and infancy of a new word that has the possibility of becoming a permanent addition to the vocabulary." Ron Butters, on the other hand, countered that "truthiness is not a lexicological nova, it is a cute, stunt-wordy flash in the lexicographical pan and will go the way of Bushlips, and about as quickly." Bushlips, defined as 'insincere political rhetoric,' is something of an albatross for the ADS. It was named Word of the Year for 1990, the first year that the organization made such a selection, and it recalls the days of Bush the Elder's notorious backtrack from his "Read my lips, no new taxes" pledge. Needless to say, Bushlips quickly withered on the vine. Some might argue that selection as the Word of the Year isn't intended to be an indicator of future success — after all, the ADS has the category "Most Likely to Succeed" for that (in 1990 it was notebook PC and rightsizing, while in 2005 it was sudoku). Rather, the Word of the Year is meant to capture something of the annual zeitgeist, and both Bushlips and truthiness accomplished that for their respective years. Now, listen up. Many of you insist that Colbert "coined" the word "truthiness." In fact, Colbert himself is the epitome of the word — as in "truthy," not "facty." Mr. "Truthy" — witty intellectual that he claims to be [Huh? I thought he was supposed to be anti-intellectual. —BZ] — did not coin "truthiness," though he did popularize it. The Oxford English Dictionary has a definition for truthy that dates back to the 1800s and includes the derivation "truthiness." And for the record, I did mention Colbert's show in the initial article that was read far and wide — or at least across New Mexico (though I did NOT credit him for inventing the word!). Seems, though, that the reference to Colbert was edited out by our national desk, which often tightens stories and drops information that they feel isn't all that important. I have no problem believing that the omission of Colbert can be blamed on the AP's national desk editors, since the full version of Clark's story did emerge in some outlets at around the same time as the shortened version. But regardless of who was responsible for leaving Colbert's name out of the national desk story, the oversight turned out to be a godsend for "The Colbert Report," according to Stephen Colbert himself (the comedian, as opposed to the absurd on-air character of "Stephen Colbert"). Colbert was recently interviewed by San Francisco Chronicle TV critic Tim Goodman as part of the Chronicle's City Arts & Lectures program, and you can listen to all four parts of the interview here in podcast form. About halfway through Part 3, Colbert talks about the honor of having truthiness named Word of the Year. He goes on to say how ecstatic he was that the AP didn't mention him, since his character was in need of a persecution complex à la Bill O'Reilly. And who knows? Maybe another successful neologism will emerge from all of this. I myself am quite fond of wordanista and will probably be using it for a long time to come.